Today marks general availability of Microsoft Flow and PowerApps, which enable people to automate workflows and quickly build custom apps that suit their specific needs. Earlier this year, we announced integration of SharePoint with Microsoft Flow, enabling you to create and launch flows directly from a SharePoint list. We also announced that native integration of PowerApps and SharePoint would drive rich new experiences to continue reinventing business processes with modern document libraries and modern lists in SharePoint. We know that tight integration is essential to unlocking productivity gains for the digital workplace. Accessing data from mobile devices was a first step. Bringing business processes to the same site for team documents and data is next. That’s why SharePoint is a great home for your enterprise business applications. As we recognize today’s milestones for PowerApps and Microsoft Flow, you can also look ahead to even deeper integration of these business tools as part of SharePoint, as we showcased at Ignite in September. PowerApps will be fully integrated into the SharePoint web experience. PowerApps provides a great mobile experience, and now that experience is connected to the data stored in SharePoint lists. Soon you’ll be able to integrate PowerApps as the default in-browser experience for any SharePoint modern list. PowerApps embedded in a SharePoint list. You’ll be able to launch PowerApps directly from the SharePoint mobile app. Modern document libraries will be made available as a data source for PowerApps and Microsoft Flow. For Microsoft Flow, you’ll be able to run any flow on demand for a specific document or list item, in addition to waiting for an automated trigger to fire. Using the data gateway, PowerApps and Microsoft Flow will work with on-premises data in SQL and SharePoint as simply as cloud-based data. Deeper integration of Power BI with SharePoint Online. Business process requires more than data and automation. Power BI has been a leader in visualization analytics, and soon you’ll be able to embed visualizations and charts from Power BI directly into a SharePoint team site. PowerApps and Microsoft Flow will be enabled automatically for most Office 365 commercial plans in November 2016. You’ll be able to connect to data in SharePoint Online and on-premises, as well as SQL, Exchange, OneDrive and a broad range of enterprise services such as Yammer, Twitter and Box. Further details on pricing are available at www.powerapps.com/pricing. We encourage you to explore the resources available at powerapps.com and flow.microsoft.com, and communicate with us at sharepoint.uservoice.com. Q. 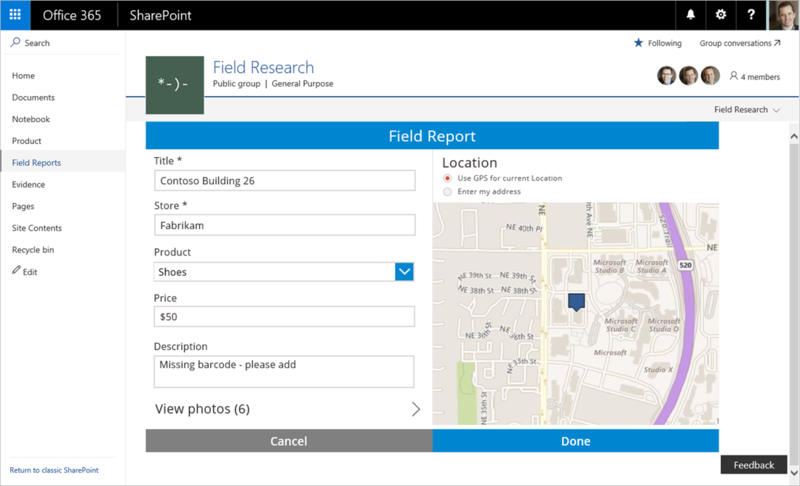 What does Microsoft’s commitment to PowerApps and Microsoft Flow mean for historic business solutions on SharePoint, like InfoPath? A. As we announced at Ignite, PowerApps and Microsoft Flow are tools for business users to build business applications and automation in SharePoint today and tomorrow. They are the successors to InfoPath and SharePoint Designer for many common business scenarios, especially custom forms used on SharePoint lists. Q. Will Microsoft still support InfoPath and SharePoint Designer? SharePoint Server 2016 will include an ongoing capability to host InfoPath Forms Services. InfoPath Forms Services on SharePoint 2016 will be supported for the duration of SharePoint 2016’s support lifecycle. InfoPath 2013 and SharePoint Designer 2013 will be the last versions of those products. SharePoint Designer is not being re-released with SharePoint Server 2016, although we will continue to support custom workflows built with SharePoint Designer and hosted on SharePoint Server 2016 and Office 365. Support for InfoPath 2013 and SharePoint Designer 2013 will match the support lifecycle for SharePoint Server 2016, running until 2026. Q. What can customers expect to see inside SharePoint Online? A. The release is principally a licensing event. If you have previously enabled preview features inside SharePoint Online, PowerApps and Microsoft Flow will continue to appear in the App Launcher and as elements of modern lists. If you had disabled access to preview features, users will see those integrations enabled in the next few weeks. Q. How can Office 365 customers connect to custom data sources? A. Every Office 365-licensed user of PowerApps and Microsoft Flow can create a custom API data connection, in addition to the intrinsic ability to connect to sources like SQL, Exchange, Yammer, Box and Twitter.